The principal cooking style in Puerto Rican cuisine is called cocina criolla, which literally means "Creole cooking." Most Americans will associate Creole cooking with the cuisine of Louisiana, but that’s not the case here. In the Spanish-speaking islands, criollo refers to Spanish Americans of European descent. Hence, cocina criolla is the cuisine created by the European (mostly Spanish) colonists using their traditional recipes made with native Caribbean foods and cooking styles. That is why you will find both native and Spanish influences, cooking techniques, and ingredients in Puerto Rican cuisine. Authentic Puerto Rican cooking starts with sofrito, which is the foundation of just about every Puerto Rican soup, stew, or sauce. Cuban and Dominican cooking also uses sofrito in their cuisines. It may be used at the start of a dish as the first thing into the cooking pot, or as a topping for grilled meats and fish. 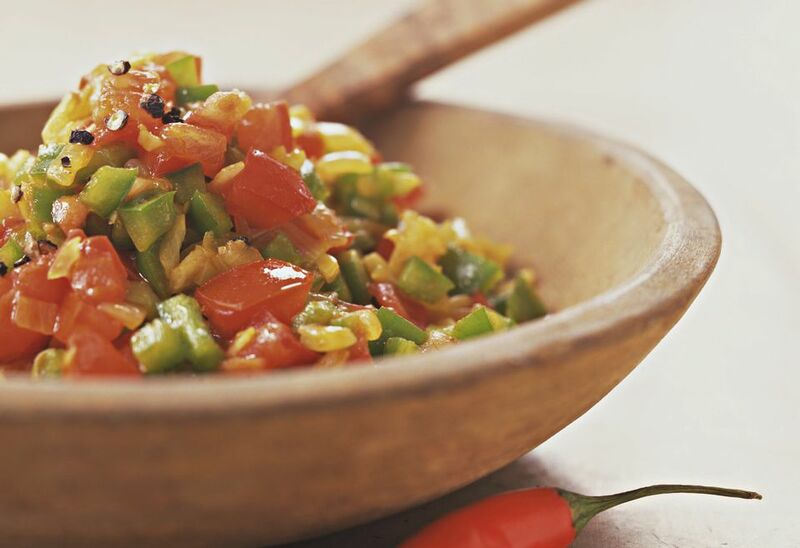 Sofrito is a versatile, aromatic purée of tomatoes, peppers, cilantro, onions, and garlic. There are many variations of this recipe, but a basic sofrito recipe is made from ingredients that are easy to find in any grocery store. It is a thick paste (like pesto) as opposed to a thinner condiment such as salsa. It can be made fresh or you can make a batch and freeze it for future use, as many people do with pesto. Adobo is another indispensable ingredient in Puerto Rican cooking used to season meat, poultry, and fish. It can be either a dry rub seasoning or a wet paste rub. You can customize the recipe by adjusting the ingredients based on the spices you prefer. The basic spices are salt, pepper, oregano, garlic powder, onion powder, and turmeric. The most flavorful meat is coated in adobo and left in the refrigerator for a day, but applying the seasoning right before cooking works well, too. You will often see adobado on menus, which means "marinated and cooked in adobo sauce." In the days before refrigeration, the mixture was used as a preservative for meat. Today, it is a base seasoning for beans, stews, sauces, stocks, and vegetables. Pasteles, which is best described as stuffed meat pastries wrapped in green banana dough, are traditionally served at Christmas time in Puerto Rico. Arroz con gandules (rice with pigeon peas) is a dish seasoned with sofrito and diced ham and considered Puerto Rico's national dish. Alcapurrias are fried ground beef-filled fritters from the Caribbean made from a mixture of grated yautia (taro root) and green banana.